Giant Schnauzers are usually as long as they are high, resulting in a square-shaped profile. This dog breed has a beard and bushy eyebrows. Giant Schnauzers have straight parallel legs and gracefully arching necks. The Giant Schnauzer is spirited and alert, with high intelligence. Giant Schnauzers originated in Germany. Giant Schnauzer males are 26 to 28 inches (66 to 71 cm). Giant Schnauzer females are 23 to 26 inches (58-66 cm). 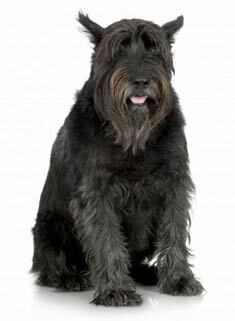 Giant Schnauzer males are 60 to 80 pounds (27 to 36 kg) Female Giant Schnauzers are 55 to 75 pounds (25-34 kg). With no odor and shedding little to no hair, Giant Schnauzers require weekly brushing to keep their undercoats from matting. Twice a year the Giant Schnauzer should be clipped all over. This is ideally done in the spring and the fall. Confident and bold, Giant Schnauzers are excellent around children, devoted and good-natured. This muscular and spirited breed requires a firm, experienced trainer. Giant Schnauzers are generally a healthy breed. Giant Schnauzers can be expected to live 12 to 15 years. Giant Schnauzers require daily exercise and love to play. They have excellent stamina and are extremely energetic. This dog breed thrives when allowed to romp in open spaces. Find Giant Schnauzer Puppies with our Free Breeder search!